Sprites on this page originally were created by Capcom. Gamepad functionality is supported (versions 1.38 and newer), see below. For gamepad functionality, for versions 1.37 and older we recommend JoyToKey for this game. For older versions, the game does not natively support gamepad controls, and chose this path for the project as it is free, portable, and requires no installation. The game allows you to use your own custom controls, but the default controls are given below. Note: If you do not press any of the controls with Beat for a short period of time, Beat moves back into automatic mode. If you wish to revert to using JoyToKey as like the previous versions, set enabled=0. 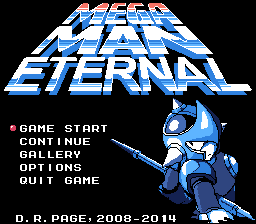 -features an event stage system: after defeating a couple Robot Masters, a special event stage will appear. Once an event appears, you can't progress to any new stages, but may visit completed stages, Auto's Shop, Gallery, or Save (and exit). -Upon unlocking Beat, a 2nd player can control beat. -Platform catching: "Just about to make it to a platform"? The game will mock you by forcing you to release the ARROW KEYs to drop if you fail to make a tight jump at times. -Many enemies were contributed to this game by fans. 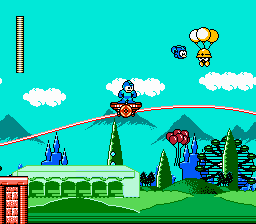 -Much of the game's music, art, and sprites were contributed by well-known artists or musicians in the Mega Man fan game community. -Up to 8 items to purchase using Bolts that are collected in the game. -Can set if starts in full screen or not. -Allows up to 5 save files. These are locally stored. -1 global file amongst files for unlockables. -10 unlockable secrets (can be enabled/disabled at the start of a new game). These can increase/ease the difficulty, or make gameplay even more interesting! -Gallery keeps track of number of game completions, and shortest run. 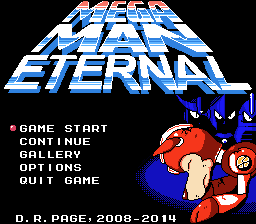 -Gallery accessible from title screen and stage select. +In the gallery, you can view art, and listen to music you encounter in the game. +Art can be unlocked by buying it in Auto's Shop, or picking it up as a rare pickup. +When viewing art you can zoom in, zoom out, and pan the images. +Music can be unlocked by encountering it first-time. If you hear it, it will appear in the music gallery. Unlocking all the art can open up a secret that you can grab in the Gallery. Unlocking both the art and music will set you on the right track to obtaining the "true ending". +Some locations in this game have alternate songs. These can be figured out by either experimentation or by completing the game. Once you unlock all the art, the ending will give you a hint on where and how to find these secrets. Weapon Energy (Ammo) - To use more of your weapons obtained from Robot Masters, you will need these when you run low. Extra Life - Grants you 1 life. If you run out of lives, you will get a game over. +Using bolts, you can have Auto make items for you to help your adventure. +Bolts can be found in levels. +Some items are conditional. For example, some secrets weapons become available in the shop if you do not obtain them in a level. +Fan art and Official/Cutscene art can be bought in the shop as well. +To Unlock: Find the four beat letters that spell BEAT. +Beat can grab items and bring them closer to you, and attack enemies. +Points out items that are in areas if they aren't dropped by enemies. -2P mode/manual mode (Using the controls for Beat, you can control Beat). +Beat has unlimited health (as usual), and if you do not press any controls while in manual mode in a short period, Beat returns to automatic mode. Unlocking Beat allows you to unlock more secrets! There may even be a secret that grants you Beat from the start. +There are a total of 10 game secrets. -To unlock a secret (9 in total): Unlock Beat, complete the game. -To unlock 1 of them: Unlock all the art in the Gallery. +These secrets allow you to customize the game, increase/ease difficulty, or even the "fun factor". The first game secret you unlock is the Bass Sabre. There are many more to unlock and have fun with! This game was created using the Game Maker 8.1 IDE. It is designed to run on Windows Operating Systems from Windows XP, up to 8.1. 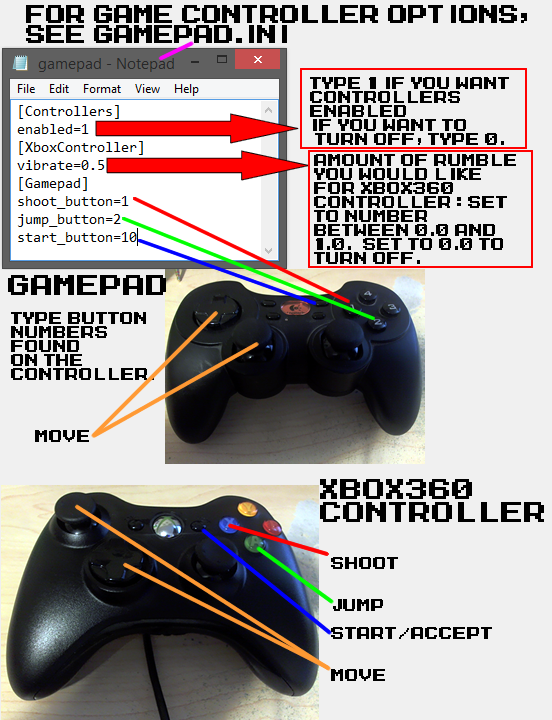 Gamepad Support: Native support for Gamepad and Xbox 360 controller (with rumble). Question: The audio stops playing completely while playing, what do I do? Answer: A couple of our testers (including myself) have experienced this. The game in a rare circumstance just stops playing music for no specific reason in the game itself. Based on experimentation, it seems to be an issue with the DLL in use for audio (SGAudio). To resolve this problem, close the program and open it again, and it will work again. Question: I get stuck in a platform or an invisible wall and can't escape, what do I do? Answer: Report this, it is likely a bug, be specific (say how long you've been playing the game at the time, what level, and where in the level). Question: The game just closes, without warning, what do I do? Answer: Report this, it is a fatal error, be specific (say how long you've been playing the game at the time, what level, and where in the level and what you were doing, screenshots are welcome). Question: When using JoyToKey for my gampad, it lags a bit. Question: I or my friend is sensitive to flashing lights or have a variant of epilepsy, can I play the game? Answer: Like most games, steady flashes of light do occur in this game. So it is not recommended to play this game if you are very sensitive to flashing lights, and be cautious if you have any variant of epilepsy. 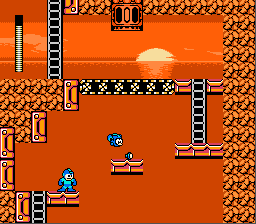 Question: The sprites are off when I run into transitions or his standing sprite (or hurt), you NEED TO FIX THESE? Answer: The choices with these were by the designer. The transitions are meant to be silly, or different. Sprite choices need not be the same as the canon series. This game isn't intended to be a replication, nor should it be judged based on that as that was never the intention from the start of this project. Question: THIS ISN'T 8-BIT, OMG? Question: He's standing in the ladder, then moves okay after whether on or off the ladder? Answer:This occurs with shorter ladders more often. Just jump or move and you'll resume just fine. Question: He keeps running (sprite, not moving) when I enter a room, why? 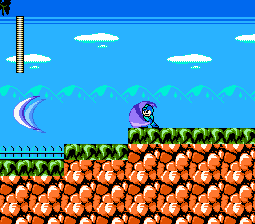 Answer: I liked him having a bit of a run into a room, he typically should return to a stand sprite eventually. It is to get you ready for the next room. Just press any of the directional buttons and it will resume to normal. Answer: This was intended to be like "a classic game" where sometimes strange anomalies do occur. If you are concerned whether it is bug or an anomaly, do report them anyways through the forums (preferred). If you have any concerns with troubleshooting or any strange experiences (not complaints) while running the game, refer to the contact page to get in touch with me. Remember that this is not a commercial product, and was made for free. If you run into any major bugs (that cause fatal closures of the program, or unexpected results (e.g., unlocking something, and not actually unlocking anything upon restarting of the game)) report them as well. The forums are a useful resource as well.